Drawing upon a background in materials science, medical devices, and work with several small technology companies, Actuated Medical was founded in 2006 with the mission to use motion technologies to improve medical devices. The company’s innovations have ushered in an entirely new generation of instruments and devices with its current focus being state–of–the-art, minimally invasive instruments for clearing occlusions, penetrating tissue, and enabling the emerging MRI–guided surgical procedure industry. Mulvihill had been involved with the Small Business Innovation Research (SBIR) program at previous companies, and leveraged that background when co-founding Actuated Medical citing the program’s ability to provide funding at earlier, riskier levels than Angel or other types of investors. Phase II and IIB SBIR grants from the National Science Foundation (NSF) SBIR program led to the development of the TubeClear® System. Using an additional SBIR grant from the National Institute of Child Health & Human Development, Actuated Medical pursued development of TubeClear models for smaller diameter feeding tubes used in pediatrics. An IRB approved clinical study is in progress at the Children’s Hospital of Philadelphia (CHOP). By using Phase I funding wisely and with FDA clearance in mind, Actuated Medical worked to obtain ISO certificates and other necessary elements of its plan. With NSF Phase IIB the TubeClear System received FDA clearance and Actuated Medical manufactured the product. The TubeClear System is now listed on multiple group purchasing organization’s approved supplier lists and is being used in multiple hospitals and VA facilities. To date, dozens have benefited from this technology. The first patient to benefit from the TubeClear System was a 27 year old soldier in the ICU at Walter Reed Army Medical Center. So, how exactly does the TubeClear System improve patient outcomes? In critically ill patients who can no longer self-feed, a feeding tube is placed in the gastrointestinal (GI) tract. These tubes clog at a 25% rate, and take an average of 20 minutes to clear. When a clog cannot be cleared the tube must be replaced which can be painful and has added procedure risks. The TubeClear System removes feeding tube clogs while the tube remains in the patient at bedside. It reduces painful and expensive tube replacements, and allows patients to quickly resume feeding and medication regimes. With approximately 7 million feeding tubes placed each year this system has the potential to make a big impact on the outcomes of many patients. “We continuously talk to end users all the way through the development process and it keeps us connected. We develop what they want – we don’t wait until the end of the process. It’s important for the engineers to see the need and design for an end user,” said Mulvihill when asked about keys to SBIR success. Using NIH/NCI SBIR grants, Actuated Medical developed the OsteoAccessTM System for improved bone marrow biopsies and aspirations. The system enables greater access to target sites and greater sample quality and volumes to improve diagnosis for cancer and other illnesses. Another NIH/NIAIDS SBIR funded project is developing an active needle-free drug delivery patch (Gentle-DispenseTM) as a platform to deliver large molecule (>500 Da) compounds. Early work demonstrated that the GentleDispense System delivered the drug to the vascular system with negligible tissue impact in a chronic preclinical study. The company has grown from five to twenty-two employees and expanded from a 2,000 square foot space to 9,000 square feet without leaving its founding locale of Bellefonte, PA. One of the company’s give backs is a vibrant summer internship program. It gives individuals the opportunity to work and gain experience in the medical device field. Currently, the company has seven summer interns. Three (a teacher, high school student, and a veteran) are supported by NSF SBIR Phase II supplements. 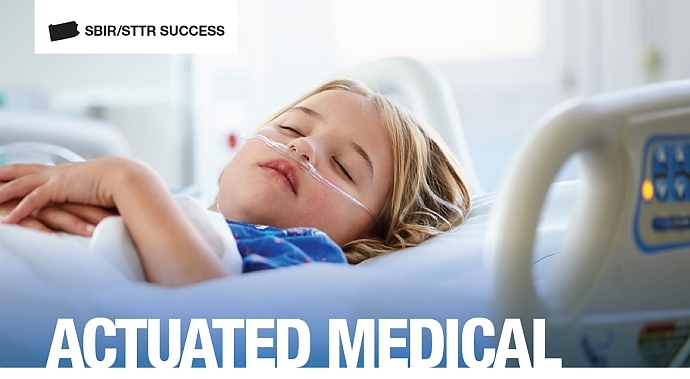 By improving patient outcomes in hospitals across the country, actively engaging end users during all steps of the product development process, and working to train and educate the next generation of innovators, Actuated Medical is, indeed, an SBIR success.